The doctor will see you now... but step into the physician's room at your local Chinese medicine clinic and chances are you will be in for a surprise. Instead of the usual middle-aged 'sinseh' of the old school, prepare to see a young man or woman who is not even 30 years old. Welcome to the fresh, young face of traditional Chinese medicine (TCM). While most of its practitioners here are aged 40 and above, TCM - an ancient medical system using treatments such as Chinese herbs, acupuncture and tui na (massage) - is getting more youthful. The number of registered TCM physicians here under the age of 30 at the end of 2010 jumped threefold from the previous year, to 79. It may represent just 3 per cent of all physicians, but the surge in interest among young folk is significant. And there are more young physicians on the way, partly due to Nanyang Technological University's (NTU) double-degree programme in biomedical sciences and TCM. Its pioneer batch of 59 graduated two years ago. One of them is Ms Karen Wee, who works in a private TCM clinic as a physician and manager, and who is just 26. She spent two years at the Beijing University of Chinese Medicine. This new generation of practitioners is not short of opportunities, either. With TCM departments and clinics in major hospitals such as Singapore General Hospital and Tan Tock Seng Hospital, there is ample demand for the centuries-old treatments. Indeed, the number of TCM practitioners has increased overall. There are now 2,540 registered TCM physicians in Singapore. There were about 1,800 in 2000. And those wanting to ride the TCM wave have another place to train besides NTU - the Singapore College of Traditional Chinese Medicine, established in 1953, which is seeing younger applicants. Of those applying to the college for a place in next year's course for an advanced diploma in TCM, about a quarter are under 30. While absolute figures are unavailable, there have been more than 100 applicants. This despite the fact that the road to becoming a TCM practitioner is a long one: Both NTU and the TCM college offer five-year programmes. The NTU programme includes a two-year stint at the Beijing University of Chinese Medicine. Such is the growing appeal of TCM as a career that recent graduate Kok Song Ling, 32, gave up a career as a project manager with Britain-based bank Barclays to do it. 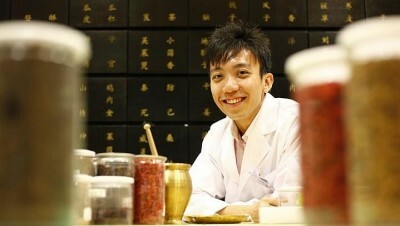 Mr Kok, who holds an advanced diploma in TCM, also holds a business degree from NTU. He practises in Jurong West at Qun Jian Medical Hall, which belongs to his family. Eu Yan Sang itself is listed on the Singapore Exchange. Revenue for its third quarter ended March 31 was almost $90 million. NTU, which has been offering its double-degree programme since 2005, will see a total of 181 graduates by next month. The programme has 200 students. It has taken in an average of 40 students a year for the past three years, most of them fresh from junior college. Graduates are required to take an examination at the TCM college before they can be certified as physicians. TCM physicians like Mr Kok say they are not surprised to see younger people taking up the vocation. He notes that his clinic is often frequented by young families with children, as well as non-Chinese patients.